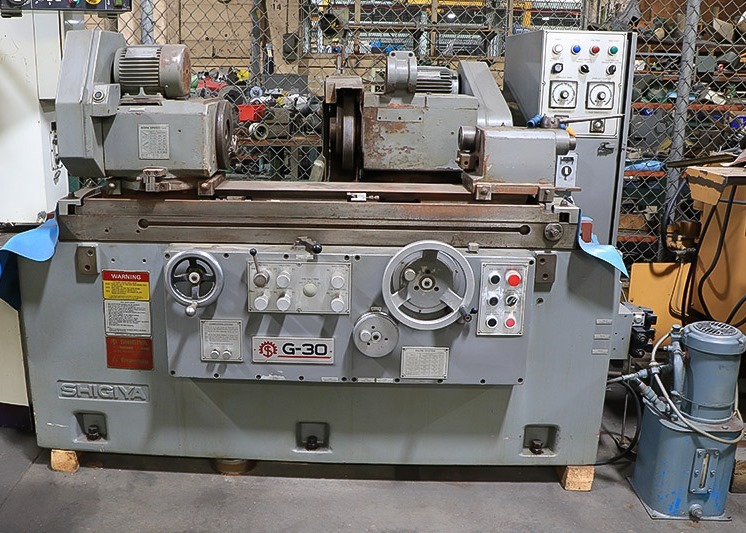 Shigiya GUA-30.60 12" x 24" Universal Cylindrical Grinder, New 1985. Please Note: This is a photo of another Shigiya GUA-30.60 that was previously sold. The present machine will be serviced by the grinder department. Longitudinal table speed....................................... 2" TO 160" ipm. Table swivels (total)............................................................ 10 deg..
Max. stroke of wheelhead (manual)......................................... 6.9". Max. auto infeed stroke............................................................ 0.4". Auto infeed rate................................................. 0.00004" TO .004". Plunge infeed......................................................... 0.0008" TO .06". One rev. of handwheel............................................................ 0.04". Handwheel, fine feed by micrfeed...................................... 0.0001". Wheelhead swivels left & right............................................ 30 deg. Grinding wheel size......................... 14" dia. X 1"-2"wide x 5" bore. Grinding wheel speeds (2)..................................... 1,675/2,013 rpm. Workhead spindle taper......................................................... #4 MT. Workhead spindle speeds (9)................................... 13 TO 252 rpm. Workhead swivelling range (total)...................................... 120 deg. Tailstock spindle taper........................................................... #4 MT. Dual rate (coarse/fine) plunge infeed. Rapid wheelhead advance & retraction. Independent sparkout timers for auto infeed & plunge grinding operations.